Update 6/5/17 – Netflix closed near its highs again. 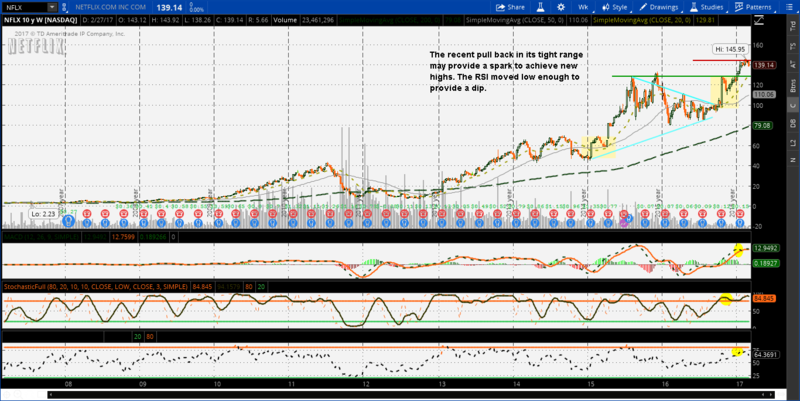 This bullish move can be a signal for the price to continue on higher. The cup and handle price target is still 180. Earnings are next month and it could keep moving. Update 4/10/17 – Netflix reports earnings next week. The chart has started to show some signals that it is ready to make a move higher again and maybe earnings can be apart of that move. It recently got close to 150 and came back down. The price has made higher lows and a squeeze is in order. One direction will be clear soon. Update 3/20/17 – Netflix has made a push and created some recent highs. It is still working to get to 150 and it could get there. The price action has been strong and the buyers are trying to flex their muscle. Update 3/6/17 – Netflix continued its rest and made a quick macro sell off. This could provide a nice entry to renew the push to 150. The leg higher is still my view as this could breakout beyond 150.